Made with a mixture of wit and formal invention, these four works form part of a series of painted relief sculptures. Melbourne critic Chris McAuliffe once playfully described Nolan’s work as ‘scrap heap Suprematism’,1 identifying its salient and visible traits as the use of humble materials and her admiration for the pioneers of non-objective art, particularly Russians Kasimir Malevich, Vladimir Tatlin and the constructivists (evident in her low-relief sculptures and red-and-white agit-prop banners). Like her colleague artist John Nixon, Nolan shares a nostalgia for the potent art of less cynical times, recalling the idealism of earlier abstract art. 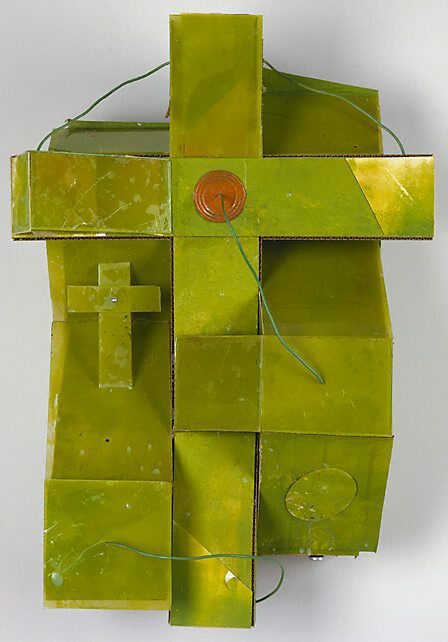 With her Catholic upbringing, she appreciates the cross as a powerful motif, but like the constructivists conflates its spirituality with the geometry of the technological age. Nolan however, imbues her abstractions with a degree of fragility and humour that can only come from a postmodern perspective. The reliefs have an air of impermanence: they are made from cardboard sheet with visible seams and glue smears only half hidden by paint. They are not technically well made, nor do they employ precious materials – if anything, the reverse. Nolan’s quirky fabrication, which seemingly uses only materials readily available to hand, offers a distinctively improvised look that suggests a feeling of exuberance and spontaneity. As in the work of the Russian artists she admires, Nolan’s jerry-built constructions are carried by the inspiring morality of the artist driven to create, no matter what materials are available. There is a directness and personal integrity in the creaking joints and seams, gangling wires and tin can lids, the sculptural equivalent of dribbles and trickles of the New York school. Indeed Nolan has cheekily described her work as being ‘like action painting’.2 Her sense of play and informal approach are confirmed in the unceremonious, casually descriptive titles she confers on each sculpture. Like the constructivists, Nolan is interested in how her materials emphasise the materiality of the work of art and how this can be engineered to access a transcendent ‘spiritual’ realm. The redemptive aspect of art, a mission revived in contemporary art by German installation artist Joseph Beuys, particularly intrigues her. In line with this, it is interesting to consider the wire or rope in her reliefs: is it used to hold a structurally unstable object together or to hold something inside? The idea of flimsy, poor materials housing something beyond vision, numinous and powerful is also implicit in the tabernacle familiar to Nolan through her Catholic upbringing and itself a trope for the relationship of body to soul, or object to idea.